Clarksville, TN – Austin Peay State University football’s Kyran Moore and Jeremiah Oatsvall were named the adidas® OVC Co-Specialist of the Week and adidas® OVC Co-Newcomer of the Week respectively, announced by the league office Sunday. Despite a 73-33 setback to FBS No. 17 UCF, Moore was electric for the Govs in every aspect of the game. The senior returned a kickoff 91 yards for a touchdown in the second quarter to pull Austin Peay within striking distance of one of the nation’s best teams. The Bessemer, Ala. native was also dominant at his usual wide receiver position. He hauled in five passes for 130 yards, including a 35-yard touchdown grab on a spectacular effort in which Moore pried loose a sure interception and turned into six points for the Governors. Oatsvall was poised and efficient in his first ever start against FBS competition. The Brentwood native was 12-18 through the air for a career-high 209 yards and two touchdowns. Oatsvall also pitched in 25 yards on the ground. This is the second consecutive week that Oatsvall has nabbed this particular award. 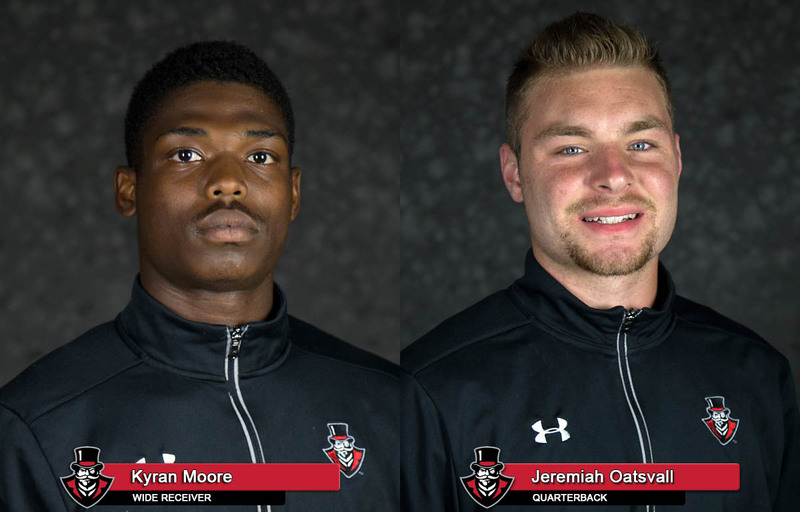 Moore and Oatsvall join teammates JaVaughn Craig (offensive), Jaison Williams (defensive), Kentel Williams (offensive) as Austin Peay football student-athletes to take home weekly conference awards this season. The Governors return to action on Saturday, when they resume OVC play at 1:30pm against Tennessee Tech in Cookeville.